So I was fooling around with iPhoto colors and my brain said, Saginaw Bay was never that BLUE! Those of you who know Michigan will know what I’m talking about. As with most inland lake bays that have a major river emptying into it, and taking into account our agricultural practices of draining fields via drainage tiles a huge amount of silt , and wash off fertilizers find their way out of the mouth of the river into the bay. Therefore NOT BLUE, think muddy brown. 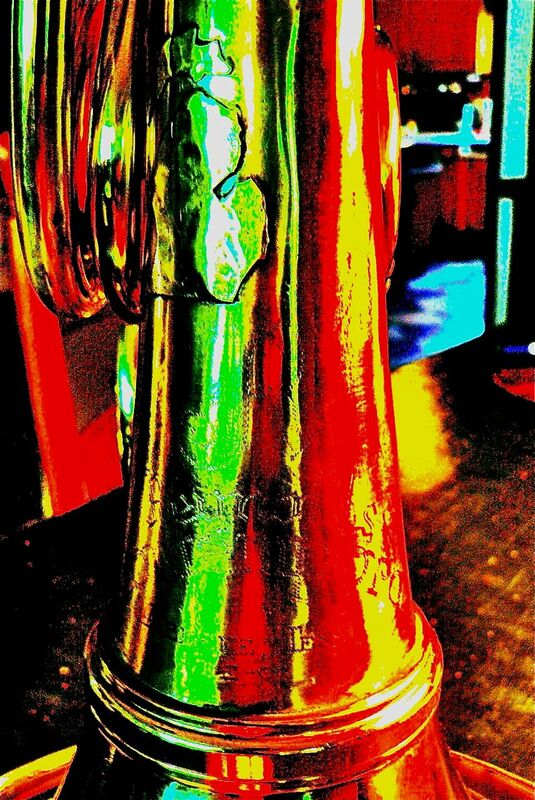 So the horn pictured is an FEO3 Reynolds, brass, that was screwbelled using my last Jupiter ringset. I’ve noticed that many of the ‘rebuilder’s’ who market on ebay with newly lacquered, buffed up horns use the Jupiter sets. The main reason is cost. The Jupiter sets are brass, not bronze and while very functional, they are not interchangeable with many other ringsets. So, If you want a horn with only a detachable flare, they’re fine, but if you want to swap different flares around the Jupiter set limits your options. Over the years I’ve built a lot of horns using these sets, but today, most players of good horns want an Alex compatible thread. The Dürk and newer Conn set are so, The Schmid ringset opens the world of Schmid flare up to a player. I’m sure there are many other interchangeable ringsets, but Holton and Jupiter seem to offer you the option of Holton or Jupiter flares or flares with those male sets. You’re welcome to chime in, because , as I’ve mentioned, many of you have forgotten more than I will ever know….